Product code: ES3852 Categories: Sold Items, Sold Jewellery. 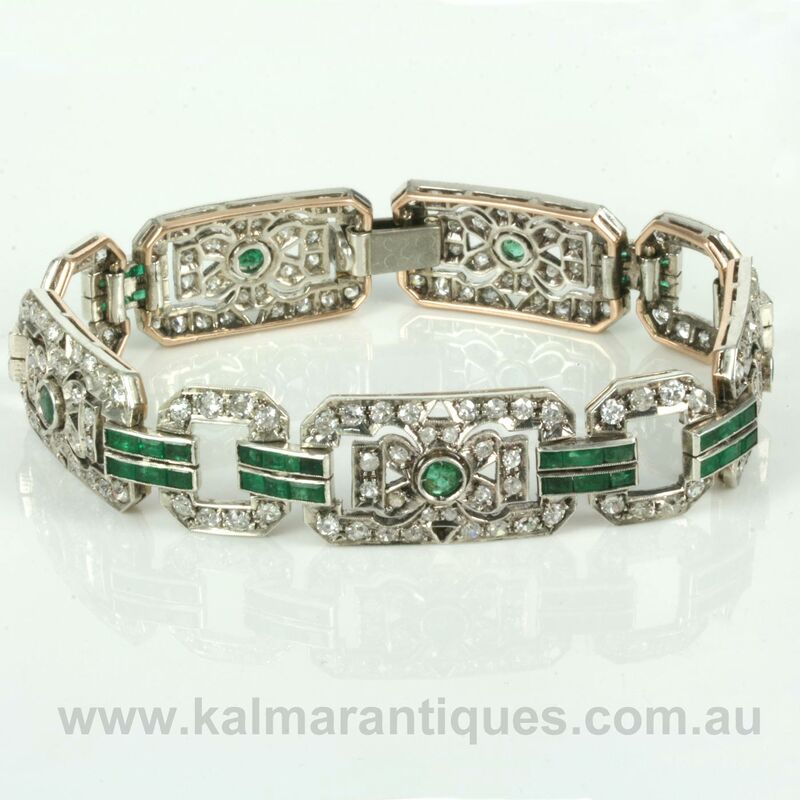 Art Deco jewellery of the 1920’s up until the 1940’s resulted in jewellery that was as stunning then as it is now and here is a truly spectacular Art Deco bracelet from the 1920;s that will take your breath away. 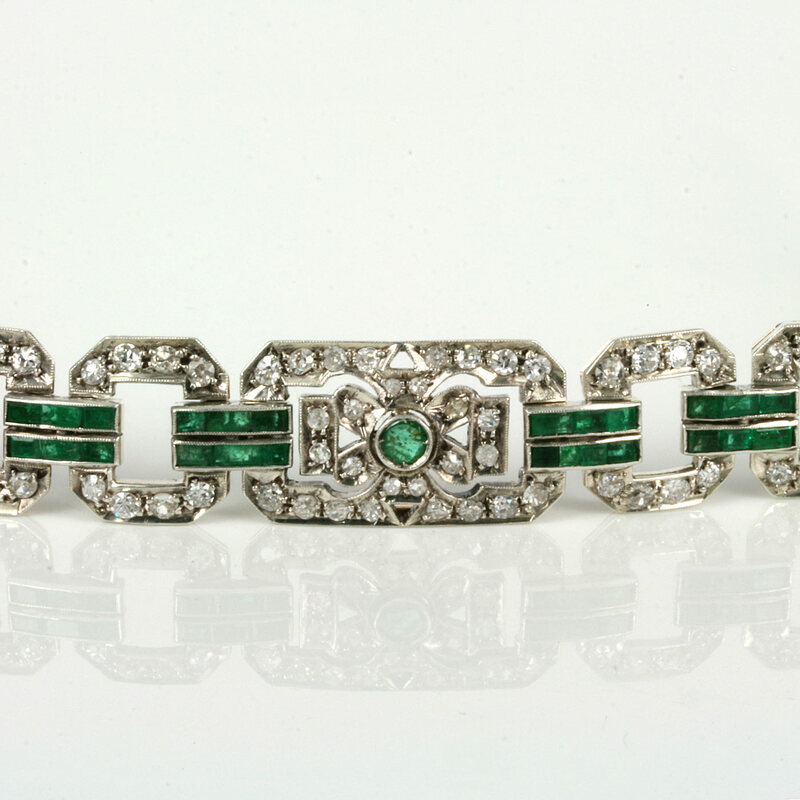 Dating from the 1920’s this Art Deco bracelet is set with emeralds and diamonds in a wonderful geometric design so typical of Art Deco jewellery. The bracelet is designed with 5 larger rectangle shaped panels connected with 4 smaller diamond set panels and parallel bars set with emeralds. Entirely hand made in 14ct rose gold and platinum, this bracelet is set with an incredible 53 natural emeralds and 175 diamonds. In total the emeralds total 4.84 carats and the diamonds a dazzling 6.10 carats making this an emerald and diamond bracelet that will certainly shine and sparkle no matter when or where it is worn. Measuring a comfortable 19.4cm in length by 1.5cm wide and wraps around the wrist so elegantly and with so much finesse. To finish it off, the clasp is set with diamonds and the catch part itself has been designed in the form of a cats head to add a personal and warm touch to it. 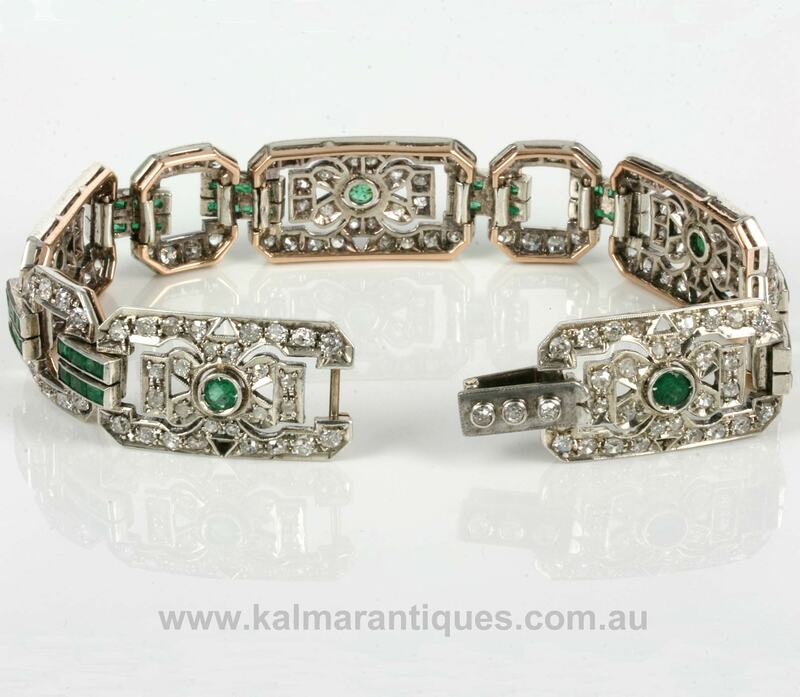 This is one of the most remarkable and elegant examples of an Art Deco bracelet and combine this with the gold and platinum as well as the natural emeralds and diamonds all goes to make this a wonderful piece of jewellery that will always be admired and appreciated for its fine quality.